For me, there are few things better than getting on the motorcycle and hitting the road for a multi-day solo motorcycle ride. Two Days. Twenty days. Any length in between. The length doesn’t matter much. Early on the morning of September 21st, 2012, I walked out to the garage and strapped the black duffel-type bag onto the luggage rack that follows the curve of the rear fender of the Road Star. The duffel, packed the previous evening, was filled with clothes that might be needed in deserts and mountain ranges, toiletries, mobile phone, and MP3 player. I also strapped a small Playmate cooler filled with ice and film onto the rear fender rack, a continuation of the fender rack. I’d be crossing deserts and I knew better than to allow my film to get cooked on the road. 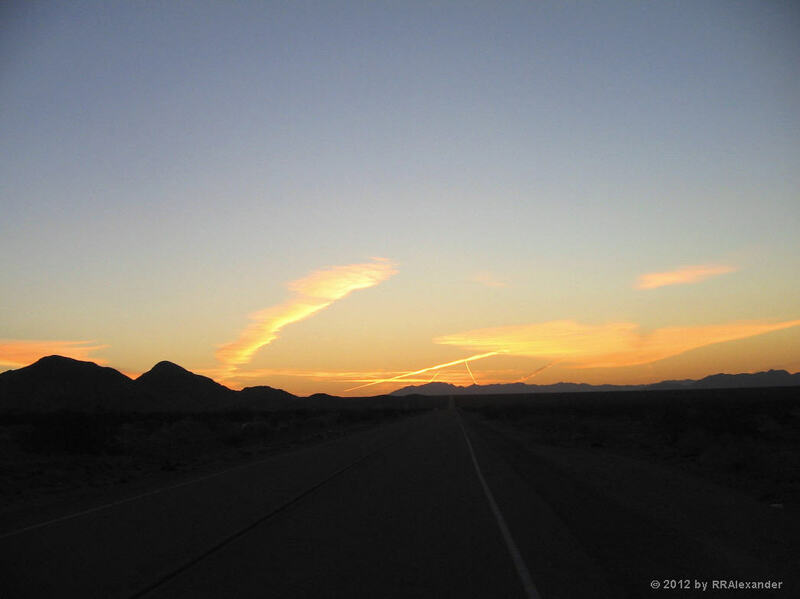 Sunrise on September 21, 2012, at Roy’s in Amboy, California. Shot with the ancient (in digital terms) Canon PowerShot A400. The saddlebags, also packed the night before, contained motorcycling items like extra gloves for both winter and summer conditions, daylight and night goggles, a scarf, and two film cameras. Normally I’d only carry one of the interchangeable lens digital cameras and wouldn’t need to take the cooler. I was traveling a bit heavy due to the film equipment, but I figured it would be worth it, since I enjoy shooting the film cameras so much. The things that I like better than a long solo motorcycle ride can be counted on one hand. On the first finger is my wife and family. The ride was a birthday present. A few weeks previously Lisa suddenly asked me what I wanted for my birthday. The question took me by surprise, since I hadn’t given it any thought. I recovered quickly however. The thing that rose up in my consciousness was a three or four day ride to Monument Valley to make photographs. Lisa, unsurprised by my answer, replied that we could easily arrange the trip. I bought color film for the medium format and 35mm cameras and poured over maps for three weeks, planning the ride. For a few days, it appeared that I wouldn’t be able to do the ride, because my Mom had taken sick and went into hospital a couple days after I had a premonition that she was going to go into the next world. For a few days it seemed that my premonition was wrong. She recovered and went home. I breathed a sigh of relief that she was alright, then continued with the ride plan. The day before the start of the ride was my birthday. I didn’t think much about it, since I was looking forward to riding the next day, but Lisa presented me with a gift-wrapped box containing a new riding jacket, as I explained in Road Trip Omen. It was like getting two birthdays at once. 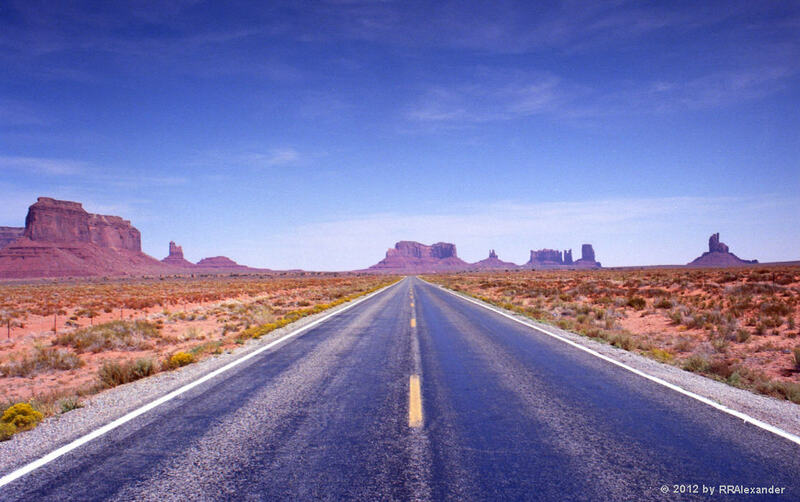 My main idea was photographing in Monument Valley, that it was more of a photography trip than motorcycle trip. But like so many plans, it didn’t work out the way I intended. The haze in the valley was thick enough that I didn’t shoot as much film as I expected. It was also hazy in Sedona, so I only shot a few frames in that area. The ride turned into an enjoyable three day scout on the bike. It was another example of why motorcycling is always an adventure. One never knows how it will go, despite all the planning that may have been done. Monument Valley, on the Navajo Reservation in Arizona. Nikon N90s (F90x) and 35mm Kodak Ektar 100 film. In the end it was a thoroughly enjoyable three days. I found an alternate route between Kingman and Seligman, Arizona, a stretch of Route 66 that is far more enjoyable to ride than Interstate 40. 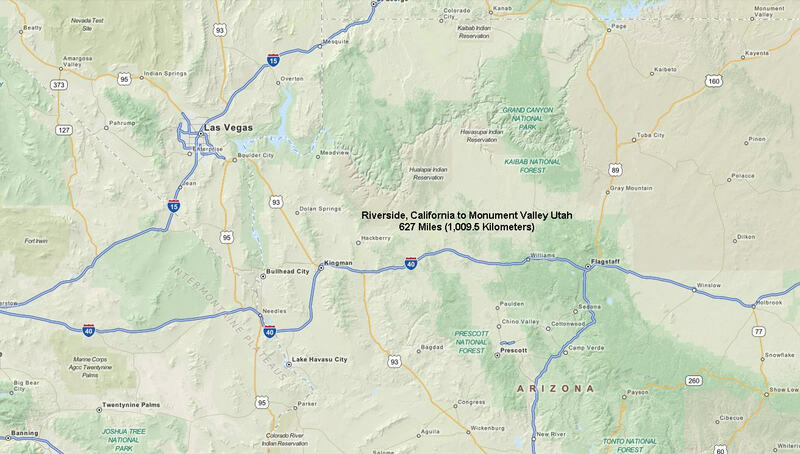 I traced a route in Arizona from Flagstaff through Sedona and Jerome that my brother Joe and I had traveled in his International Harvester pickup truck with my Harley in the back in 1972. I stopped in Topock, Arizona, on the east side of the Colorado River and visited with my aunt Kass, who I hadn’t seen in over a decade.